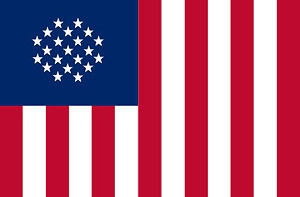 Flag of the New Cheyenne government. Jericho began as a clever twist on the classic small-town serial template: Peyton Place. It featured local power struggles, infidelities, and the mysterious return of a family's black-sheep son. The twist? It’s set against a post-apocalyptic backdrop. 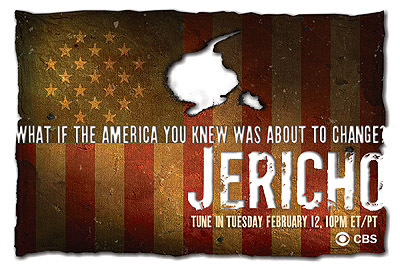 Jericho is a small town that finds itself isolated when multiple US cities are devastated by nuclear explosions. The first season was a genre soaper that ranked somewhere between Buffy and Smallville. It was canceled, but fan outcry resurrected the show. It ran for a second season of only seven episodes. Apparently, at that point the creators decided to go for broke. 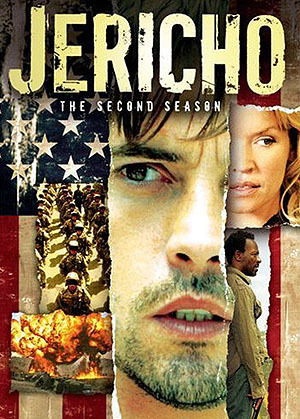 The SECOND SEASON of Jericho turned out to be the most radically subversive, overtly political drama ever aired on American television. The town was put under martial law. A government contractor called Jennings & Rall was brought in to manage city services, medical supplies, etc., and wound up controlling the local economy. When the citizens rebelled, J&R's security arm, Ravenwood, was called in. The townsfolk were treated as insurgents. JAKE: It's not about convincing one man he's wrong, It's a whole system. Jennings & Rall's corporate HQ, located across the street from a new American capitol J&R is building in Cheyenne. Find out more about the government contractor that's helping to build a better America!